The perennially popular Toyota Prius is a hatchback that has enough comfortable seating for five adult passengers. The hatchback is offered in a number of great-looking trims, including the One, Two, Two Eco, Three, Three Touring, Four, and Four Touring. The Toyota Prius C and the plug-in Toyota Prius Prime are not included in the traditional Toyota Prius lineup. 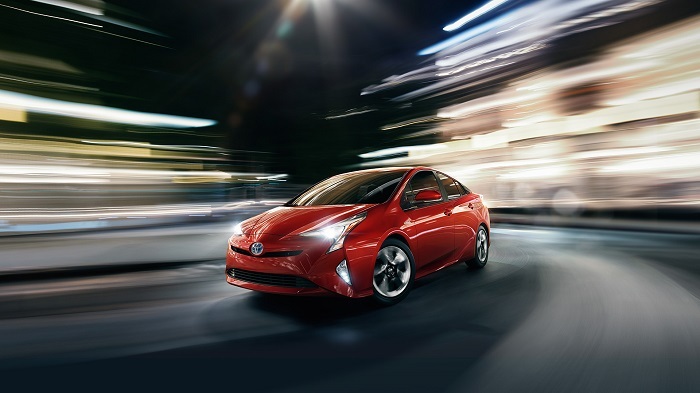 Being California Toyota dealers, we’re proud to tell you that every Toyota Prius trim comes with a suite of advanced safety and driver assist features as standard equipment. The hatchback’s sought-after safety features include automatic high beams, a forward collision warning and automatic emergency braking system, adaptive cruise control, and a lane departure and mitigation system. No matter which trim you decide to buy or lease from our Toyota dealership near Los Angeles, CA, your hatchback will have plenty of desirable standard features. The One and Two trims have similar equipment. On these trims you’ll find two 4.2-inch driver information displays, a 6.1-inch touchscreen, Bluetooth™ connectivity, voice commands, a rearview camera, a USB port, and an auxiliary audio jack. As you’d expect, the higher trims have even more standard features. To see all the features on your favorite Toyota Prius trim, visit Keyes Toyota. If you’re ready to buy or lease a 2018 Toyota Prius, submit an application for financing to our Van Nuys, CA Toyota finance center now.